The Exmark 24-in. 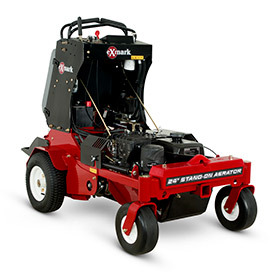 Stand-On Aerator features a compact design that significantly increases the productivity and efficiency of lawn care professionals aerating smaller properties. Designed to easily fit through 36-in. gates, the machine features an efficient hydro drive system with infinite speed control up to 6.8-mph. The compact design heightens maneuverability, and the simple, ergonomic controls are easy to use. Mass is centralized over the coring tines for maximum core depth consistency, which is electronically adjustable from 0.5- to 5-in.—no tools required. The machine is also equipped with a Smart Controller that tracks machine hours and maintenance reminders.